I was driving down the road one day last week, if sitting through three red light cycles per intersection due to horrendous traffic could rightfully be called “driving,” that is. Hot and sweaty, filthy, emotionally drained, and exhausted from cleaning and hauling, I was making my way from my best friend’s flooded house to help out at my ninety-five year old grandmother’s flooded house, guilt-stricken that I couldn’t be in both places at once. I was listening to one of my favorite theological podcasts, and when the host began talking about the flooding in Baton Rouge, my ears perked up. He began talking about God’s sovereignty- that, because God always does what is best for believers – for our discipline, growth in holiness, increased dependence on Christ, and the like – that this flood was good for us. He said it kindly, lovingly, and backed up with Scripture. And he was absolutely right. Yet, three days after a life-altering catastrophe, with a heart still raw and broken for my loved ones and my community, it was exactly what I did not need to hear. It’s crucial to bring good theology to bear on every situation we face in life. We need to apply Scripture to the situations we go through in order to help us make biblical sense of things, walk obediently, give thanks, and glorify God. And yet, the Bible doesn’t say, “Give a theology lecture to those who weep.” It says, “Weep with those who weep.” Why? God is all about the Word, isn’t He? Why wouldn’t He want us to jump right in and exhort hurting people with scriptural principles? Because He knows us. He created us. People need a minute to take a breath and absorb everything that has happened to them before their hearts and minds are ready to transition into thinking theologically about the situation. Sometimes we just need to sit and cry for a while. And maybe we need someone we love to sit and cry with us. No Romans 8:28. No talk about how God is going to use this to grow us. No discussion of whether God “caused” or “allowed” this tragedy. Just some time to grieve without having to think. And God’s word says that’s OK.
Now when Job’s three friends heard of all this evil that had come upon him, they came each from his own place, Eliphaz the Temanite, Bildad the Shuhite, and Zophar the Naamathite. They made an appointment together to come to show him sympathy and comfort him. And when they saw him from a distance, they did not recognize him. And they raised their voices and wept, and they tore their robes and sprinkled dust on their heads toward heaven. And they sat with him on the ground seven days and seven nights, and no one spoke a word to him, for they saw that his suffering was very great. But sometimes, even with the best of intentions, maybe without even realizing it, we skip the vital step of making an appointment to sympathize with and comfort our suffering loved ones. We neglect to rend our hearts and sit on the ground and weep with those who mourn. We fail to see that their suffering is very great. And yet this is one of the very ministries Christ calls us to. A time to discuss theology, and a time to weep with those who weep. Imagine 90% of the homes and businesses in your town destroyed by a flood. Thousands of your friends and neighbors rescued from rapidly rising deadly currents by boat, sometimes, literally, with only the clothes on their backs. Some separated from spouses or young children for days because they had to get into different boats and ended up at different shelters. No homes to go back to. No jobs to go back to because businesses flood just like homes do. No cars to drive because cars flood, too. No clothes, no food, and often, no money to rebuild and replace everything they owned. Now try to imagine, in the aftermath, having to choose whether to scramble to clean out your own flood ravaged house before it molds and mildews or helping a loved one who desperately needs you. Or, if your home didn’t flood, feeling torn between helping your family, your best friend, your church, and other relief ministries. This is the situation my community, and communities across south Louisiana, are facing right now. Those of us whose homes and businesses God spared are doing what we can to help friends, loved ones, and strangers, but we are spread dreadfully thin. Shelters and relief ministries are in desperate need of food, supplies, and volunteers. In Louisiana, we take great pride in taking care of our own, and our locals are doing an astounding job of it. But the situation is so overwhelming that this time we need help. We need your help. We need your church’s help. How? Could you spare a few days or more to come down and volunteer with a flood relief ministry? Could your church send a team? Would you like to make a donation, or could your church collect a love offering, to help the many people whose lives have been turned upside down by the flood? If you have a contact at a church near a hurricane damaged area, get with that person and find out how their church is helping or needs help. If you don’t have a contact in the area, get with your local Southern Baptist association (you can do this even if you’re not Southern Baptist) and find out if they’re organizing help, offering disaster relief training, or collecting donations. If you don’t have a local association, contact Southern Baptist Disaster Relief and find out if they could use a team from your church or if you could make a donation. There are two reasons I strongly recommend donating to, or volunteering with, SBDR or a local doctrinally sound church rather than a secular or governmental agency: first, SBDR or a trustworthy church will not merely help people with physical needs, they will also share the gospel with the people they’re helping, and that could make this hurricane the best thing that’s ever happened to somebody. Second, as my area witnessed with local churches, the “Cajun Navy,” and other neighbor helping neighbor relief efforts, it seems like the more grassroots the organization, the better and less expensive the help. I even heard a government official say something similar to that on the news yesterday. 1. Do not just get a bunch of people together and drive to Texas with no contact person to organize your group, especially right now when the resource grid is down. That is not “stepping out on faith,” that is acting in foolishness, and possibly doing more harm than good. You need to have a confirmed place to stay, access to food, working plumbing and utilities, and somebody to put you to work where work is needed. 2. I would personally not recommend donating to Red Cross based on what I have heard from local flood victims. They have a very high overhead, and I have heard nothing but complaints about how they deal with people personally and the red tape that’s involved with getting help. Again, if you’re going to donate, I strongly recommend either donating to SBDR or directly to a church in the area that’s helping people and sharing the gospel with them. 3. This one comes from a local pastor friend who is still coordinating flood relief efforts in my area: Do not randomly send used clothing to the area. If your church can put together a team to travel to Texas to help and you can wait a few months to go, you may want to consider that. What’s going to happen is that a lot of people are going to volunteer right now while Harvey is fresh on everybody’s mind, and then people are going to forget about it and go about life as usual. But the hurricane victims will still need help months down the road from now. Start thinking about Thanksgiving break, Christmas break, 2018 winter/Easter/spring break when students and other people in your church might be off school and work. That will also give you time to start collecting monetary (and material, if needed) donations to take with you. Don’t forget about the little guys. Something I observed with both last year’s flooding and Hurricane Katrina was that media attention was focused almost exclusively on the major cities of Baton Rouge and New Orleans. Smaller towns and rural areas were virtually ignored (even though, during last year’s flood, it was a few smaller towns on the outskirts of Baton Rouge that received the majority of the damage) in the coverage. With the media’s current focus on Houston, it looks like the same thing is happening with Harvey. When you’re thinking about flood relief, don’t forget about the small towns and rural areas that may have received even more damage than the major cities and have fewer resources. Pray. Tangible help is desperately needed, but spiritual help is even more important. And God is the One who coordinates that disaster relief. Pray for specific people you know. Pray for the spread of the gospel. Pray that Christians affected by the hurricane will grow in their dependence on Christ. Pray that God will provide for the needs of the people. Pray that God will give Christian disaster relief workers the right words and opportunities to share the gospel with people. Let’s all be in prayer for those affected by this devastating hurricane. PLEASE SEE THE COMMENTS SECTION FOR READER SUGGESTIONS AND INFORMATION ON HOW YOU CAN HELP THOSE IMPACTED BY HURRICANE HARVEY. Regular readers: This week’s edition of The Mailbag answers the question I’ve received from several readers: “How can we help with flood relief?” I’m posting it today, Sunday, in hopes you can catch your pastor or small group at church and talk to them about sending a team or a love offering. Please share this around to help us get the word out, and thank you so much for your love and desire to help. If so, I’d like to direct you to the relief efforts at New Covenant Church. New Covenant is about 15 minutes from me in Denham Springs, Louisiana, one of the hardest hit areas. Blessedly, God spared this precious church to be a ministry to others during this difficult time. New Covenant is a doctrinally sound local church where several friends and loved ones of mine, including the associate pastor (who is heading up flood relief efforts there), are members. My family and I have worshiped with New Covenant numerous times. If you or your church would like to help by making a donation, I can personally assure you that your money will be handled in a godly way and will go directly to flood victims who will also hear the biblical gospel. New Covenant needs volunteers for various aspects of relief ministry, too, and would welcome you or a group from your church if you are able to come down here and help out. You can give on line or via text. And, if you’d like to come down and help out, you can contact Pastor Todd Whirley by phone or e-mail, or (possibly more quickly- phone service is still somewhat spotty) by private message on Facebook or Twitter. Thank you so much for your kindness, prayers, compassion, and generosity, and please share this with your friends and on social media to help us get the word out. Same street as the one in the video above. As many of you know, I live in Baton Rouge, Louisiana, where the Alton Sterling shooting took place two weeks ago. Since that time, multiple intense, but peaceful, protests have been conducted. On the coattails of these events, Sunday morning, as you may have seen on the news, we had an ambush shooting about seven miles from my house in which six law enforcement officers were shot and three were killed. Investigators subsequently discovered that the shooter had traveled to Baton Rouge from out of state with the specific intent of killing police officers. I haven’t commented on these events until now because I really haven’t known what to say. Like everyone else, I’ve had emotional, gut level reactions to these tragedies, but it’s not always wise, or necessarily godly, to express those raw reactions in a public forum. I couldn’t think of a way to share my thoughts in a way that would build y’all up in Christ, so I just remained silent. • Pour the gospel into your children, grandchildren, children at your church, and any other children in your circle of influence, that they might come to know Christ as Savior at an early age and walk in His ways all the days of their lives. The same day Alton Sterling was killed, my 20 year old daughter was in a serious car accident. She could have been killed. It struck me later that, in a moment, my child was spared while, in another moment, another mother lost her child that day. If my child had died, I know she would have stepped into eternity with Christ. I don’t know if Alton’s mother had that same comfort. We can’t guarantee our children’s salvation, but we should do everything we can to raise them in a Christ-centered way. We never know when their last day will be. • When someone loses a loved one – whether that loved one is sinner or saint, cop or criminal, black or white – it hurts. Deeply. Those of us who belong to Christ must reach out to people who are hurting and minister the love, peace, and comfort of the gospel to them, regardless of their circumstances. • “Herd mentality,” so to speak, has to stop. We have to stop seeing people – whether we’re talking about “the black community” or “the police” or any other segment of our culture – as groups and start getting to know, love, and share the gospel with people – one on one – as individuals. One of the things I’ve observed in the past two weeks is intentional, proactive acts of love, kindness, friendship, and neighborliness between individual protesters and police, between individual citizens and police, and between individual black and white citizens. Viewing people as impersonal groups rather than as individuals distances us from them and even allows us to feel superior to them. Christians view people as Christ views people- individually created in the image of God, individually loved and cherished by God, and individual sinners in need of a Savior. We must – individually – invest in the lives of other people, loving them, caring for them, sharing the gospel with them, discipling them. • The election isn’t going to solve the problems we’re seeing in our communities. Neither are laws. Neither are protests, speeches, community unity events, ecumenical prayer vigils, care packages, celebrity opinions and appearances, community improvement grants, or any of the other usual responses to these kinds of events, even though some of them may be temporarily helpful. We seem to have the idea that, “If we would just _____, the world would be fixed.” And I’m not so sure that’s the case. As I mentioned in this recent article, the world is the way it is because of sin and the Fall, not because of our failure to “do something”. No matter how busy the church gets, the world is generally going to continue to get worse. Our job as Christians is not to fix the world, it’s to stand firm in Christ wherever He has planted us and to rescue as many people around us as we can with the gospel. Our message to our neighbors is not that we can make the world a better place, but that Christ is our only hope regardless of the state of the world. In these perilous times, Christians must be completely focused on Christ. Worshiping Him, trusting Him, proclaiming Him, and reaching out to others in His name. The words jump off the page, off the screen, from our lips. A haunting breath whispering of unspeakable tragedy and heart rending grief. 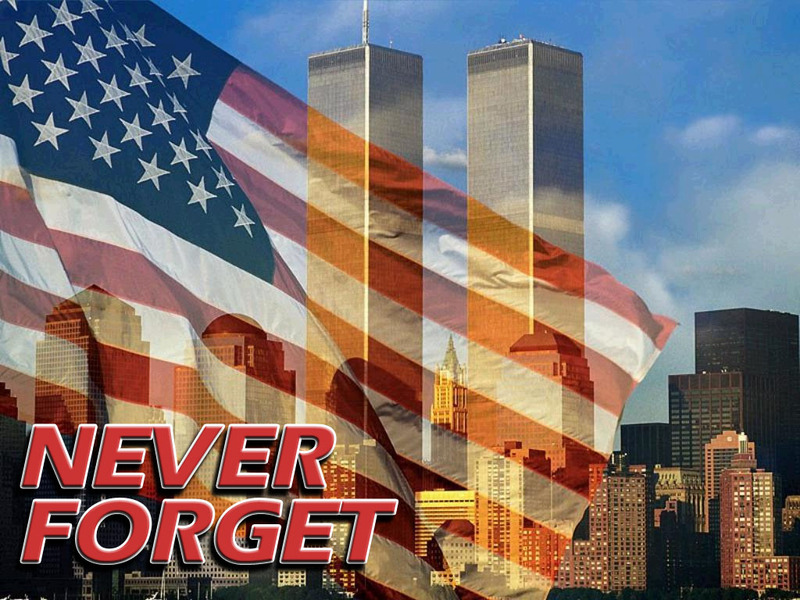 The terrorist attacks of September 11, 2001 did something to this country. It changed our history. It changed us. It was a despicable act of cruelty. People innocent of any crime against their executioners were brutally slaughtered in service to a god who demands the death of infidels. It was egregious. Horrific. Abominable. 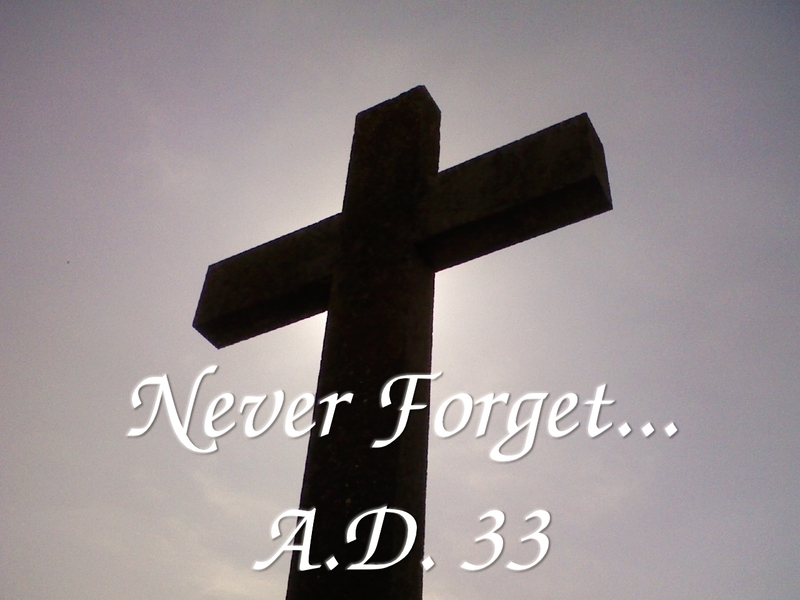 And we will never forget. Nor should we. The words lie quietly on the page, beckoning us back to another day. A day dusty with the passing of centuries. But it changed our history. It changed us. It was a despicable act of cruelty. Jesus, innocent of any crime, was brutally slaughtered by executioners serving a God who demands the death of infidels. But this was no infidel. This was no innocent victim dying needlessly and for no one. This was God Himself laying down His life to take the place of the infidel. You. Me. He satisfied His own wrath against us by pouring it out on His Son. It was egregiously beautiful. A horrific triumph. Abominably liberating. And we will never forget. Nor should we. How Now Shall We Pray? Last week, an unspeakable tragedy happened. We all wish there were something we could do to fix things and make things better for those who lost loved ones in Connecticut. Well, there is something we can do. We can pray for them. If you’re like me, your initial reaction is probably a feeling of, “That’s not enough. I need to do more.” Yes, it will be kind and compassionate to donate to the various funds that will be established, or to send a note of condolence. And if God moves you to do so, you absolutely should show His love in these ways. The families need to receive comfort and encouragement from God’s people, showing them God’s love. But, if you think about it -especially if you’ve lost a loved one- you know that no act of kindness from a human being can bring the healing of the heart that these folks need. The only way these families will experience true healing, peace, and comfort is through the direct intervention of the Man of Sorrows who is acquainted with grief. We cannot truly help them, but He can. 1. Many coming to know Christ as Savior. For some, a situation like this is a reminder of their own mortality and the eternity that will follow. Pray that people will bow the knee to Christ as the Holy Spirit woos their hearts, and be sensitive -wherever you happen to be located- to opportunities to share the gospel with people who are searching for answers in the wake of tragedy. 2. Bible-believing Christians and churches reaching out to the victims’ families with the love and comfort that can only be found in Christ. This is a time for the church to be the church and serve her neighbors. It’s likely that most of these families are not financially or logistically prepared to deal with the practical aspects of dealing with the death of a child or other family member. Pray that God will provide for the victims’ families and ease any struggles with “red tape” at this time. Here’s another area in which the church can serve them. Please feel free to share this around. Let’s get as many people praying as possible.